Of the three components that make up Wake Atoll, Peale is the “deserted island.” Inaccessible by road since the wooden bridge burned over a decade ago, Peale has quietly slipped into obscurity. Vines and brush have swallowed the vestiges of the Pan American complex and the contractors’ naval air base facility construction, much of it bombed to ruins in the war or left to the ravages of time and tide in the postwar years. The rusty hulk of the 8” Japanese gun and a concrete pillbox still face the empty sea near the point. Behind them, over a little rise, lies the broad turquoise lagoon and, about a mile across, the low profile of Wilkes. An adequate distance, Titian Peale might say. Back in January 2013 I wrote a post about the Wilkes side of Wake atoll, which had the dubious honor of being named for Lt. Charles Wilkes, who led the U. S. Exploring Expedition of 1838-42. Wilkes, who named scores of islands, points, bays, straights, and other geographical locations during the expedition’s surveying tours of Antarctica, the Pacific, and Puget Sound, did not deem anything on “Wake’s Island” worthy of naming during their brief stop there in 1841 and probably would have been highly insulted to have his own name affixed to such an insignificant spot. 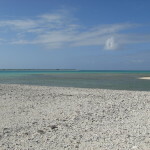 The two islets of Wake atoll were named Wilkes and Peale by scientists on the U.S.S. Tanager during a civilian scientific expedition in 1923. Clearly they knew the history of the Wilkes expedition and its controversial leader. Why they chose to name the other islet after naturalist Titian Peale – rather than another officer or scientist on the expedition – is a mystery. Perhaps it was the prickly personalities of the two. Recently I picked up Nathaniel Philbrick’s Sea of Glory: America’s Voyage of Discovery, the U.S. Exploring Expedition (Penguin Books, 2003) to fill in details of this momentous but little known expedition. Six ships and 346 men set sail from Virginia in the summer of 1838 under the command of Lt. Charles Wilkes. The Secretary of the Navy tasked the expedition with a daunting agenda of surveying the region around the South Pole, islands of the South Pacific, and Puget Sound and waterways in the Pacific Northwest for eastern shipping and whaling interests. In addition, the expedition’s scientists would record and collect specimens of flora, fauna, and ethnographic artifacts. The nine-man scientific corps included Titian Ramsey Peale (1799-1885), an artist and naturalist, and others specializing in botany, mineralogy, and philology. The scientists collected, identified, and preserved thousands of specimens and artifacts, shipping most back to the United States during the four-year voyage. The collection is housed in the Smithsonian Museum. Philbrick notes that Peale personally contributed 2,150 birds, 134 mammals, and 588 fish, as well as many artifacts. Titian Peale spent most of the expedition on the USS Peacock while Charles Wilkes commanded the expedition from the flagship Vincennes. Wilkes’s priority was surveying and the scientists often chafed at early restrictions on their access to land and collection of specimens – a “sorry business,” as Peale noted east of Tahiti. Peale brought another valuable skill to the mission: he was a “crack shot,” as even Wilkes acknowledged. He brought down mass quantities of birds and Wilkes called him to the front line when facing down hostile Pacific Islanders. Three years and thousands of miles into the voyage, the Peacock floundered on the bar of the Columbia River. All hands escaped with the clothes on their backs and a few scientific journals. The accounts of the expedition by Philbrick and Jessie Poesch are full of accomplishments at great cost and harsh personal interactions. The not-very-momentous visit to Wake Island is documented in Peale’s trip journal as the U.S. Exploring Expedition embarked on its final leg westward from Hawaii back to America (the long way). They sailed west in pleasant weather and the “usual monotony of a sea voyage,” searching for “sundry islands” in the mid-Pacific with no material success until sighting Wake’s Island on the morning of December 20, 1841. The USS Vincennes stood off as boats were lowered for the survey crew and scientific corps. 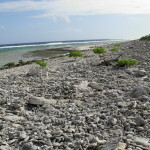 Peale described the atoll’s general characteristics and lack of fresh water or coconuts. A remarkable sight was the “enormous coral blocks thrown up by sea violence,” a few of which were as much as twenty feet in diameter. The naturalist got to work, noting an abundance of rats and identifying ten bird species by scientific name with some commentary about nesting habits. (With uncharacteristic generosity, Wilkes commented in the narrative that “Mr. Peale found here the short-tailed albatross, and procured an egg from its nest.”) Peale observed an abundance of colorful fish in the lagoon, but as the day wore on he found the “sun powerfully hot, white coral sand very unpleasant.” Likely all were happy to return to ship that afternoon at 4:30 p.m. and leave Wake in their wake. Though prideful, vindictive, and possessed of rigid principles, Charles Wilkes and Titian Peale persevered and brought the nineteenth century U.S. Exploring Expedition to its conclusion in 1842. Fame and honor eluded both men but on lonely little Wake Island their names live on, appropriately separated by a mile-wide lagoon. Very, very interesting…thanks for sharing.